Yes, Squash is Paleo but…. Squash is a Starchy Vegetable! Most vegetables are Paleo approved because of their nutritional values and amazing health benefits. However, there are vegetables which are healthy but have their own downside. This is not true for all vegetables but definitely has to be taken in consideration upon consumption as it may pose threat to one’s health. A very good example is squash. Squash is definitely Paleo but like potato, it is high in starch content and about 90% of its total calories come from carbohydrates. (That’s why it is categorized as a starchy vegetable). However, recent study showed that not all starch is the same. The starch content of squash actually has some key health benefits. Most carbohydrates found in squash, especially the winter variety come from polysaccharides found in the cell walls. These include pectins which often include special chains of D-galacturonic acid called homogalacturonan. These starch-related components in winter squash have antioxidant, anti-inflammatory, as well as anti-diabetic and insulin-regulating properties. While not really bad and prohibited in the Paleo Diet because of its considerable amounts of antioxidants, vitamins and minerals, squash should be consumed in moderation by people who are trying to maintain or lose weight. Squash is a versatile vegetable that can be found throughout the world all year round. It is technically a fruit that belongs to the pumpkin family (Cucurbita). Squash grows on long vines and have large and fleshy fruits. It has creamy texture, a nutty flavor and a sweet aroma. The most common squash is orange in color. One of the oldest crops, squash origin dates back to 10,000 years ago and is popular to the Native Americans where they were first cultivated before being brought to Europe. Squash is very flexible and is commonly used in salads and soups. Every part of squash can be eaten. Its seeds are also edible and can be used as oil when extracted. The leaves, shoots and tendrils of squash are can be used for omelets and soups too. Squash characteristics vary on its type. Its color can range from pale orange to green and its texture can have surface bumps and horizontal stripes. There are two main varieties of squash: winter and summer. The classification is based on when the squash is typically used. Summer squash is available all winter while winter squash are on the markets during late summer and fall and even during winter. Summer squash are harvested when immature and the skin is still tender. They have a bushy growth habit. Winter squash on the other hand are harvested when fully matured and their skins are already tough. Winter squash comes in different shapes. It can be round and elongated, scalloped and pear shaped and its flesh can be golden yellow to bright orange. Acorn squash Harvested with green skin and orange patches and yellow-orange flesh. Acorn squash is small and round in shape. It has a fibrous flesh and sweet, nutty and peppery taste. Butternut squash has a large-pear shape with beige skin and deep orange color. Its taste is sweet and nutty and similar to that of potatoes. Butternut squash has a bulbous end and pale, creamy skin. It is normally used in making soups. Hubbard squash is a larger-sized squash with irregular shape which color can be dark green, grey-blue or orange-red. This type has a yellow flesh and its skin is somehow warted and has a flavor that is less sweet compared to other varieties. Hubbard squash is perfect for pies. Turban squash is green in color and could either be speckled or stripes. It has a yellow-orange flesh with a taste similar to hazelnut. It is named for its shape and is best used for pies and centerpieces with the top sliced off and the hollow filled with soup. Kabocha squash A type of Japanese squash that has a very sweet flavor and is often dry and flaky. It has deep green, bluish grey skin and orange flesh. It is also known as Ebisu, Delica, Hokkaido or Japanese pumpkin. Banana Squash has a shape and color similar to banana, hence the name. The flesh is bright orange and has a fine texture. Its taste is sweet too. 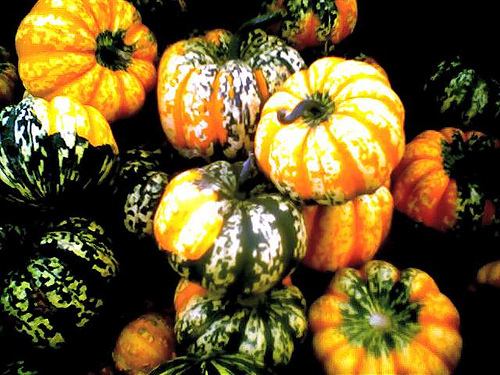 Carnival Squash is cream in color with dark green spots in vertical stripes. It has hard and thick skin with yellow flesh. It is great for soups. Delicata Squash Also called peanut squash, this type is one of the tastier among the winter squashes. It has a creamy pulp with taste like corn. Spaghetti Squash or vegetable spaghetti is a small watermelon-shaped squash that has a golden yellow and oval rind with a mild and nutty flavor. Its strands resemble to spaghetti pasta when cooked. Fairytale Pumpkin Squash A unique edible and ornamental pumpkin with thick and tender outside. The flesh is deep orange with a sweet taste. This type is normally used for baking. Gold Nugget Squash is similar to normal pumpkin, only it is smaller. Both the skin and flesh are orange in color. Sweet Dumpling Squash This type of winter squash is small and has a mildly sweet-taste that resembles a miniature pumpkin with its top pushed in. The skin is cream in color with green specks. It has sweet and tender orange flesh and is a great size for stuffing and baking. Zucchini are normally green in color but can be yellow or dark green with pale green stripes occasionally. It is long with flattened sides and has an average sweet taste. It can grow as big as a baseball bat. Pattypan Squash Often called as UFO squash, it has shape like a flying saucer with scalloped sides. It is tougher than any other summer squash. Its color is usually yellow or light green and is good in stews. Crookneck Squash Yellow in color, it bulbous at the botton with a thin curved top. It can be as smooth as zucchini but oftentimes, have bumpy texture. It is another tough summer squash with a bland taste. Zephyr Squash This summer squash can be easily recognized because of its two toned color. The bottom is light green and the top is yellow. Cousa Squash is a typical squash found in Middle Eastern cuisine. It is sweeter and tender that zucchini and has a very thin skin. Its shape is similar to zucchini too. Round Zucchini is a spherical shaped summer squash in dark green, light green and yellow color. It has a grapefruit-like shape. Tatuma Squash A Mexican variety, referred to as calabacita, Tatuma squash is spherical in shape and can either be light or dark green in color. It has many tiny seed and thin skin. Ronde de Nice is another spherical summer squash, only speckled, with a light green color and. It is also known as Gourmet Globe and is sweeter than the round zucchini. Tinda Squash has a pale green, with perfectly smooth skin. Its shape is similar to a beefsteak tomato. The flesh is white and creamy. Luffa Squash or luffa gourd is a summer squash that turns into loofah when fully mature. This ridged squash has a taste similar to zucchini when harvested young. The notable health benefits of squash come from the organic compounds, nutrients, vitamins, and minerals that they contain. Squash is rich in vitamin A and has significant amounts of vitamins B6, C, E, niacin, pantothenic acid, and folate It also contains minerals such as calcium, copper, iron, magnesium, manganese, potassium and phosphorus. Squash is a very good source of carotenoids which are antioxidants that have anti-inflammatory and benefits. Based on research conducted, winter squash could be a primary food source of alpha-carotene and beta-carotenes like lutein, zeaxanthin, and beta-cryptoxanthin. Squash is packed with vitamins, minerals and antioxidants that have a serious punch in terms of healthy benefits. Among any other vegetable, squash has more than the average daily value in terms of vitamin A which could be 400% more than the daily required vitamin A. Vitamin A is essential for good vision. Together with the massive amounts of beta carotene found in squash, they can help lower the risk of macular degeneration, glaucoma, cataracts and other visual impairments. Squash is rich in vitamin C, magnesium, and other antioxidants which help ward off free radicals in the body that is connected with several types of illnesses including heart diseases and cancer. The high levels of vitamin A and phytonutrients like lutien and zeaxanthin work together to help the body boost its immune system. The antioxidants and omega 3 fatty acids found in squash have anti-inflammatory effects that have impact in reducing ulcers and inflammation in the cardiovascular system. Vitamin A has been associated with reduced risk of lung and mouth cancers. The magnesium and potassium present in squash combine to form a very effective defensive line against cardiovascular diseases. Potassium is a vasodilator that helps relax the tension of blood vessels and arteries, therefore increasing blood flow and reducing the stress on the heart. The fiber, including pectin in squash is very good at removing excess cholesterol from the walls of arteries, thereby reducing the chances of atherosclerosis, heart attacks, and strokes. Copper and iron in squash are also important components of red blood cells and can increase blood circulation. The high amounts of vitamin A and carotenoid beta-cryptoxanthin in squash have been linked to reduced risk of emphysema and lung cancer by protecting the lungs.